Even if you’re not a subscriber to Spacing or a frequenter of the Drake, you’ll know that there’s a new push for urbanism (and an old push against it by a certain beleaguered mayor and his ilk). The new urbanists have their opponents licked when it comes to data and mapping—they can whip together a mashup faster than Ford find a drivethru—and our fair town does admirably well on one of the measures of desire: walkability. 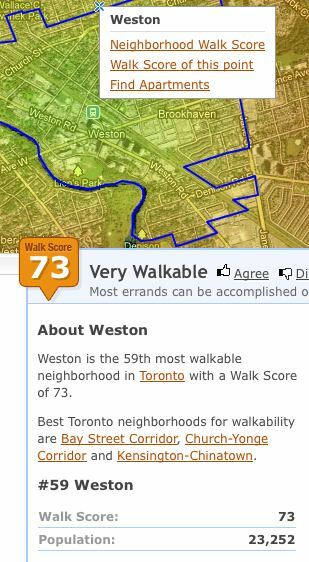 We get a 73%, or “Very Walkable” score on Walkscore.com, which indexes towns and neighbourhoods automatically. The site says that most of your daily chores can be accomplished on foot in Weston—true, if you ask me—and that there is plenty of transit. The Junction beats us, but we have the chi-chi Baby Point licked. They have a lousy 70%. This has always been Toronto’s strong suit: doing stuff on foot. Walking obviously helps people ti really see their neighbourhood, its problems, beauties, strengths and needs. It keeps us out of our cars, moving at a human pace. The neighbourhood is what we see, and walking is how we see it and make ourselves part of the landscape. Hooray for walking and can we help make Weston Road more walkable?